I have come to the conclusion that pink slips of paper are not what redeem our grandmothers, nor is checking off ordinances the fulfillment of the promise that our hearts would turn to our mothers and our mothers’ hearts would turn to us. I have nothing against doing temple work, and I do believe it is an important component of redeeming the dead. I just don’t think that is the whole picture. I believe that part of our work is to redeem the dead from oblivion, to find the stories of those who came before and to tell them. Remembrance is redemption, and that is how our hearts turn. That is how you make an eternal family. I have been volunteering as an indexer for the Church for the last year and a half. I am completing my PhD in the history of France, so I almost always choose to do French parish registers. One of the joys of doing parish records, rather than a census or a passenger list, is that you get stories if you’re paying attention. These people aren’t my ancestors, but I rather doubt their descendants are looking for them. I can read, and find, and piece together the stories of someone entirely forgotten. For the Church’s purpose, the only thing that matters is the date of the event and the full name of the person(s) involved. There is no way for me to record or index any of the other things that leap out at you. I remember one particularly sad day reading a village register that recorded a baby’s birth, then a few days later the mother’s death, then a week or so later the baby’s death. Each record is discrete, so only by reading sequentially do you realize they are part of a larger story. Many village records show that the people were illiterate, signing legal acts with an X with the help of the parish priest. That bereaved husband left no diary to tell this story; the baby had no descendants to seek this record. That moment of supernal joy followed by deep grief is lost entirely, but for me reading the register. Each of those acts went separately into the church’s system, and it would take a skilled researcher to put it back together again. Who would bother? How could you trace illiterate peasants, and why would you if they weren’t your ancestors to begin with? But I know them. I read their story and imagined what that would be like. A young mother frightened and excited all at once. A father first relieved and joyful, then grief-stricken and destroyed. A baby, who barely lived long enough to have a name. I will remember. Remembering their pain, remembering a baby that never grew to have descendants is a redemptive act and one that ties us more surely than any ordinance to the dead. I will know those I have found when I meet them. They won’t need a heavenly name tag. I have come to know them here, so I will recognize them there. How do you remember those who have lost? What does it mean to you to redeem the dead? Em is a lifelong member with a handsome husband and no kids, finishing a PhD in modern French history. Amen to that. I am a believer in telling stories, both our own and those of the past. My mom is getting older now, and sometimes I find myself panicked that she might die without me having recorded her stories. I have this strong sense that a part of her will always live on if I record her stories. I love that you are digging through this old parish records and seeing and caring about the stories so long buried. “I have come to know them here, so I will recognize them there.” That feels true to me. I’m estranged from the temple at present so perhaps that is why I rarely give a thought to the people of the past. But your post reminds me there is a richness to connecting with our forebears that I am probably missing out on. I’m sorry someone did your grandmother’s temple work, denying you the possibility of doing it (or not doing it) yourself. Someone sealed my grandmother to her second husband without anyone in the family knowing or asking for it. The Mormon doctrine of eternal families is equal parts wonderful and confusing/frustrating. Thank you for this, Em. I, too, am a historian, and I have felt a similar pull toward stories; toward knowing the lives behind the names. Remembrance and reclamation from obscurity are part of redemption. I occasionally hear people comment that they don’t understand why we invest so much time and effort in work for the dead when we could be serving the living. Your story of the lost baby is, for me, part of the answer. We live in a time and place of medical advancements that remove many of us from the constant specter of death, but we are unique in this respect. Many cultures have lived with death as an ever present shadow. The notion that we can find our dead, that we can reclaim them, is one of the more beautiful elements of Mormon theology for me. Beautiful comment. Stories are so powerful, and that reclaiming belief is one of my favorite parts of our theology too. Thank you. When I was a member of the church I had absolutely no problems what so ever performing baptisms for the dead. NONE. On the other side now going on two years I have a different perspective. I feel badly that I did this act so blindly without really giving any thought behind my act. I feel badly because I did not pay attention to many of the dates or names and feel that I may have inadvertently baptized Holocaust victims. Now, I feel a great deal of guilt like I committed not only a great sin, but a great miscarriage of justice. Our own Article of Faith states that we respect people of different faiths and we allow them to practice their faith according to their wishes and tenants. I feel as though baptism for the dead is quite contradictory. If we really believe this to be true and correct doctrine, then wouldn’t we leave other peoples relatives alone who don’t practice Mormonism in the hear and the now? In my opinion we don’t let people practice according to their faith tenants. We go after people even after they died and who can’t very well give any audible voice as to whether they wanted us to do this for them or not. Its not enough for me to have someone say, well they(the dead) have the right to reject the work being done, a dead person can give consent any more than a minor who is alive and living can give consent. I choose to remember the dead by remembering the things we did together, I remember the dead by respecting how they were buried according to their own family traditions. But isn’t it based in LDS theology that dead people can in fact give consent? So if we are rejecting LDS theology here by saying that the dead cannot give consent, then we must also reject that there is any kind of religious conversion for them at all. I’m not trying to be patronizing, honest. Just curious. You are not incorrect in your response with regard to the fact that LDS theology believe that the dead can give consent, but, it seems to me that its implied consent meaning that consent which is given through inaction or silence. This still bothers me, especially, when many members do work on people who are not their own family or as I stated do work on Jewish people for whom many, many prominent Rabbis’ have asked us not to do and rightly so. They were murdered during WWll specifically, because of their being Jewish. We are no better than Hitler when we casually disregard their right to be left alone. Another reason this is troublesome is when members do the work for infants. Why? because as in life, babies and young minor children can’t give consent(verbally or otherwise) this consent generally comes in the form of parental consent. Are we then going to say we as a church get to super cede parental authority and baptize babies and young children regardless of parental wishes? Their parents already made the decision to bury them according to their faith traditions. If they had wanted them to be buried according to Mormon traditions, they would have contacted someone with in the church and had the specific ordinances performed. Again, when we do this we completely disregard our one of the major tenants under the Article of Faiths which states that we respect people of other faith traditions and allow them to pursue their faith in the same matter that we pursue ours. Doesn’t baptizing people who haven’t come knocking on our door, specifically, when they are dead seem to contradict this statement? I’m curious how you reconcile the two competing ideas. It is impossible to do posthumous LDS baptisms for infants, at least through the official medium. I think LDS theology allows for posthumous baptism without harm because 1) the dead can give consent and 2) most Mormons who perform baptisms believe that the person for whom they are being baptized will want to accept it. I guess I’m more interested in consistency here. I think that’s what most Mormons would disagree with you on: we aren’t claiming them as our own because we aren’t making the decision for them. If you don’t believe that the dead are sentient enough to accept or not accept a posthumous baptism, then what does a posthumous baptism even do at all? You once again have ignored the most important piece of my argument which surrounds the Article of Faith which states that we (as Mormons) respect people of other faiths and respect their rights to practice their faiths according to their traditions. How do our actions with regard to baptizing people after they are dead reconcile that doctrine? Jewish People don’t have missionaries because they let people come to their own decision with regard to faith. Shouldn’t we do the same? And interestingly enough you also side stepped the question on how moral and or ethical is it for members of our faith to baptize other people children who btw can’t give consent when they are living, but, we turn around and say that even though they are minors that they can give consent in the next life, Aren’t we counsel by the prophet to up hold all laws? or do we just ignore that because they dead? I’m only addressing one thing (theological consistency) because that’s what I’m most interested in discussing, but I’ll address your other points if you’d like. Re: consent of minors. The idea behind a child not being able to legally give consent is because they have limited experience and perspective which might hinder them from making the best possible choice. Would not a complete removal of the mortal veil and receiving of an eternal mantel via death give them the experience and perspective they need in order to make the choice of accepting a posthumous baptism? Re: 10th article of faith. Again, a posthumous baptism is nothing without the acceptance of the person for whom the baptism is officiated. We are not forcing them into Mormonism. Please do not mistake my disagreement with patronization. Again, you are refusing to discuss in any real way other than the standard pat answer that just about every Mormon gives to address any concern that people who do not believe the same as us have a right to have addressed, leave peoples ancestors who have been buried according to their faiths alone. The Prophet, Joseph Smith gave us this commandment in the Article of Faith which again states” we respect people of other faiths, and we respect their right to practice their faith according to that tradition. We were also counseled by Prophets, to obey all laws in the areas where we live. In my opinion, Baptism for the Dead, goes directly against this Principle. We can’t say that we respect the rights of people to worship according to their father'(Isn’t that one of the first paragraphs in the BOM) We don’t. I know that I have hurt many people by performing Baptisms without their permission. I no longer have the mental gymnastics necessary that tells me its okay to totally go against someone else faith tradition because its all up to the other person whether or not they accept they accept the ordinance. You keep asking for consistency. HMM, there’s a lot of things in “Mormon Theology” which aren’t consistent. Baptism for the dead, especially, as it pertains to minor children and Jews is just one of those inconsistencies. Until, we stop doing this, People will always call us a weird people. This post is about honoring the dead. I can find many ways to honor the dead, other than by doing ordinances that the family has not asked us to perform. That is showing true respect. Em, I loved your post so much. Part of that love stems from the fact that the word “remember” has been my favorite for as long as I can remember, and it will almost certainly make a significant appearance in my impending dissertation (as the philosophy of memory). Another part stems from this morning. Very early, and despite 12+ inches of snow blanketing the earth, I sat in a chair in the Salt Lake Temple while smiling, wispy haired women laid their hands on me to bless and initiate women who have passed on. As I sat there, I read the names written on the pink slip of paper, the names I had to try my best to pronounce. I read where the women were from, and the only date (or dates) that extractors could recover. While others may not have thought about those long deceased women today, I did, if only for a moment. I hoped that it mattered that my body was present, even though I was sleepy and a tad bit grumpy from the storm. I hoped it was enough. Your belief in the redemptive quality of remembering is beautiful, and I believe accurate. When we take the Sacrament each week we promise to remember, and when we keep that promise (to the best of our human abilities) God remembers us. Also, in normal life, we remember and think about who we love. We give them space in our minds and in our attention. Remembering is love, and love is redemptive. My favorite philosopher, Søren Kierkegaard, wrote a great chapter about remembering those who have died in a great book called “Works of Love.” Kierkegaard believes that that kind of remembering is actually the purest love we can give, because when we recall those who have passed on, we do it not expecting anything in return. It is like mailing a letter that we need to send, even when we don’t think a message will be returned. Em, this is such a powerful post. I strongly believe in witnessing the sacred parts of others’ lives, even when we know as few details as the chronology of dates. 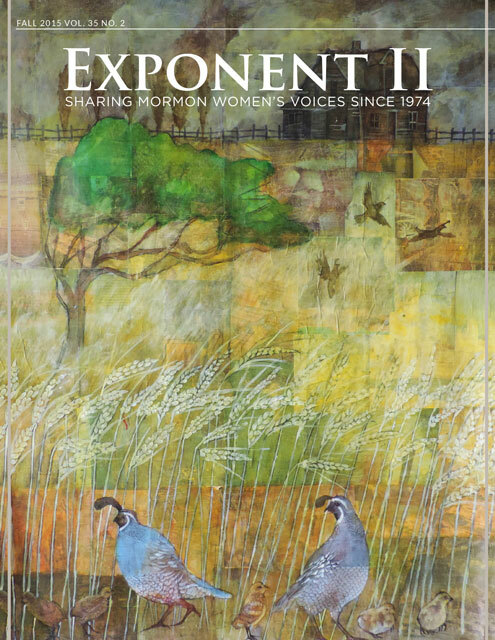 Exponent II did a book last year in which women wrote about the objects they had inherited from their ancestresses and the stories and connections they derived from those objects, http://www.exponentii.org/magazine/habits-of-being-mormon-womens-material-culture. I think holding on to those objects can be a great way to redeem our dead. Oh, my. That’s quite a story, and I’m glad you were paying close attention so that someone is here to remember it. About ten years before she died, I helped my grandmother collect personal histories from a large wedge of her family. As you can imagine, there are some pretty hair-raising stories in there, but there was one that particularly bothered her, to the point that she wanted to edit out some parts (suffice it to say that it involved children out of wedlock and underage smoking). We had quite a fight about it, but the story ended up staying in exactly as it was written. If we aren’t honest about our ancestors’ shortcomings, how can we be honest with ourselves? Way to go, Libby! I am so glad you won the day. I think messy histories that tell true stories are so much better than the other version. I try really hard to write real things in my journal (when I actually write in my journal), and not to edit things out for fear that a descendent might see it one day. I want them to see that things weren’t perfect, including with my faith and myself. Such an insightful post. I love the final image of you recognizing the women whose work you’ve done. So moving. I’m grateful for memory. I feel like as long as I remember, nobody I have lost is gone. I was sorting through a drawer of mementos this afternoon and found the card my grandma wrote to me shortly after my wedding. She wrote “Congratulations! You’ve passed the first six months test! Good luck with the Life test — it’s harder. Love, Gram.” She passed a few months ago. I feel like as long as I have her cards, her picture, my memories, she isn’t gone. If I can imitate the way she said kwafee (coffee) and kwanah (corner) and ahkestrah (orchestra) then she is still around, lamenting how you can’t get a decent cup of coffee anywhere. I know that the Gospel teaches us that people aren’t really gone. But they sure feel gone. Remembering helps.